The Haryana Forest Department is busy withdrawing all complaints against contractors and district officials for violating wildlife and forest laws in connection with the construction of a canal through Saraswati Wildlife Sanctuary (sws). In a letter dated August 21, available with Down To Earth, the Deputy Chief Conservator of Forests, Kurukshetra, has asked divisional forest officers (dfos) to withdraw the complaints. The move derives sanction from a Central Empowered Committee's (cec's) July 2008 order. The committee, which advises the Supreme Court on forest related matters, observed the violations, but did not exonerate the contractors and officials. It said that "no further action is required as the sanctuary has been denotified now" and also because Haryana's irrigation department has voluntarily deposited Rs 1 crore for conservation work in the state. The move has not gone down well with conservationists, who say cec has ignored facts to favour senior forest officials in Haryana. The Hansi-Butana Canal is linked to the water sharing dispute between Punjab and Haryana, and is a major election issue in both the states. Crisscrossing 16 districts of Haryana, the irrigation channel is to receive water from Punjab's Bhakra Main Line Canal. The state irrigation department started work on the canal's last section that passes through the sanctuary--spread over 4,452 hectares (ha) in Kurukshetra and Kaithal districts--in February 2007, but without the required clearances. Diversion of forestland for non-forest purposes requires clearances under the Forest Conservation Act (fca), 1980. Besides, a Supreme Court (sc) order of 2000 prohibits non-forest activities (involves felling of trees and clearing of land) in protected areas (pas) even if approval under fca has been obtained. Construction work inside pas also violate the Wildlife Protection Act (wpa), 1972. The matter came to light when the then dfo of Kurukshetra forest division refused to allow canal work to proceed. His objections were overlooked by senior forest officials, including the then Chief Wildlife Warden who allowed the irrigation department to bring in heavy machinery to sws. Subsequently, in May 2007, the dfo lodged a damage report (equivalent to fir) against the contractors and irrigation department officials for unauthorized entry into the reserved forest, movement of heavy machinery, felling trees and poaching. The Principal Chief Conservator of Forests, however, wrote to the chief minister recommending that action be taken against the dfo for holding up the canal's construction. This led to his suspension and the work continued. In August 2007, the Wildlife Trust of India (wti), a conservation organization, raised the issue before cec asking it to halt the canal construction. wti contended that the canal alters the sanctuary boundary, stranding wildlife on either side of the canal. The construction had also led to felling of trees and excavation of earth, it said, and urged cec to take action against guilty officials. To justify the violation, the forest department said that the canal would act as waterhole and prevent animals from straying outside the sanctuary. According to conservationists, a canal is not a proper waterhole. Besides, it was not part of the sanctuary management plan. In subsequent submissions, the forest department said that in 2002, the state government proposed to denotify the sanctuary, since it is primarily a plantation area. 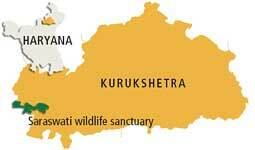 The National Wildlife Board denotified the Saraswati Wildlife Sanctuary in September 2007. Following this, in October that year, the Union Ministry of Environment and Forests allowed the diversion of about 2 ha of forestland for the canal. But by that time, the canal was close to completion. "Since a parallel process of denotification was on, cec could not do much except point out that violation had taken place and asked the irrigation department to deposit Rs 1 crore with the forest department for conservation work," says Ritwik Dutta, environmental lawyer. It is illegal to withdraw cases of violations using the cec order. Cases of violations have to be dealt according to the law, he says. It is surprising that cec's order doesn't raise the issue of punitive action against the erring officials except to note that such violations should not be allowed to recur, says Lalit Sharma of Ekta Parishad, a Bhopal-based people's rights organization. "It is hardly a deterrent," he says. Ashok Kumar, vice chairman of wti calls cec's order a hasty decision which will set a precedent for other cases.